Chatham-Kent offers the best of all worlds... fulfilling career opportunities and an incredible personal life. With a unique mix of urban and rural settings we have the amenities you're looking for, all wrapped up in a warm, small town welcome. Discover all that Chatham-Kent has to offer; affordable homes in safe communities, a rich cultural heritage, and one of the most moderate climates in the entire country. Chatham-Kent has over 100 miles of shoreline, world class fishing, some of the best bird-watching on the continent, 9 challenging golf course and lots of boating and water sports. 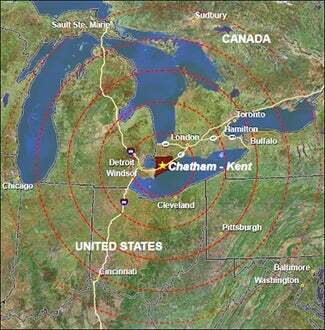 Chatham-Kent's population is 108,177 and has 3 major border crossings within an hour's drive of our Municipality. Chatham-Kent boasts a campus of St. Clair College of Applied Arts and Technology with a 950 student enrolment, and also the University of Guelph, Ridgetown Campus. Both have student housing. Chatham-Kent is also located within commuting distances of the following post-secondary educational facilities: University of Western Ontario (London), Fanshawe College (London), University of Windsor (Windsor), St. Clair College (Windsor), Lambton College (Sarnia), University of Detroit (Detroit Michigan), Wayne State University (Detroit Michigan). The Chatham-Kent Municipal Airport has a 5,000 foot lighted, paved runway. The airport offers chartered rental and instruction services, and provisions for corporate aircraft. Customs service is available by per-arrangement. The Municipality of Chatham-Kent is made up of a number of communities each unique in their own right. They are Blenheim, Bothwell, Chatham, Dresden, Ridgetown, Thamesville, Wallaceburg and Wheatley. Chatham-Kent has two hospitals. The Chatham-Kent Health Alliances has two campuses, one in Chatham and one in Wallaceburg. We have several walk-in clinics throughout the Municipality for those who have no primary physician. Chatham-Kent has 10 newspapers some being daily and some being weekly. We also have 5 local radio stations to serve the area. Chatham-Kent has very affordable homes, some of the most affordable in Ontario and with the moderate climate and all the amenities, it makes Chatham-Kent one of the most desirable areas in Ontario to make your home. Chatham-Kent is a proud, proactive and progressive community, committed to celebrating its diversity and ensuring a high quality of life for all of its residents. Once you get to know all that Chatham-Kent has to offer, you'll know it's the right move for you.